is a mobile unit serving preschoolers and child care providers throughout Jackson, Macon and Swain counties and the Qualla Boundary with story times, teacher and parent workshops, teaching aids and parenting and family resources. The Rover is funded by community support as well as by local library funds. Additional support comes from area Friends of the Library and civic groups, North Carolina Community Foundations and private donations. i Visit our Reading Rover Resource Page for information to view materials and resources available for checkout, organized thematically. To learn more, download our brochure (pdf). See our Events Calendar for the Rover's current schedule. Please note the Rover is off-road in January and July. The storyteller, Peggy Gibby, reads stories to preschoolers and leads them in learning songs/rhymes, the Rover driver, Joan Lackey, assists teachers in selecting library materials for their classrooms. At some centers the children select their own library books from the Rover. Books, puzzles, music, puppets, and storytelling kits from the Rover help teachers of young children make learning fun. 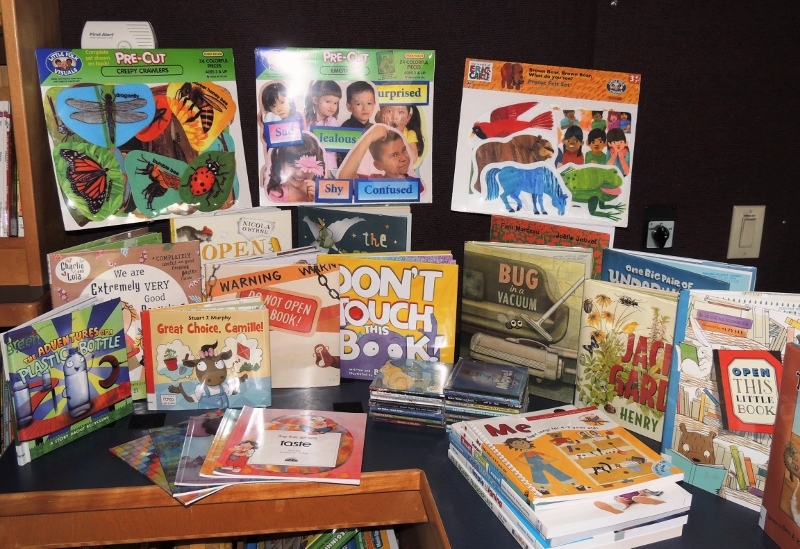 Items on the Reading Rover can be checked out by the directors, teachers, staff, and parents of the centers the Rover visits as long as they have an FRL Library Card. Items from the Rover can be returned to the Rover or to any FRL location. In addition, Outreach Services Librarian, Deanna Lyles, offers training classes to childcare teachers, giving tips on selecting age-appropriate books for the classroom and offering assistance in using the variety of Rover puppets, storytelling kits and books for teaching pre-reading skills. Training classes are also offered to parents for teaching skills on using library materials to develop pre-reading skills at home. The Reading Rover Bookmobile visits 24 childcare centers in our service area, bringing storytime and library materials "to the door" with the purpose of strengthening pre-reading skills. Since the Rover is "off the road" in July, we run the Rover Summer Reading Program in May and June. All classrooms visited by the Reading Rover are encouraged to participate by keeping a classroom reading record and by checking out many Rover books to meet their reading goal. What do teachers and children think about the Reading Rover? "Kids love story time! They look forward to having stories read to them by someone new." "Story time promotes the love of reading, increases vocabulary, and improves language skills." The Reading Rover "supplies materials to go along with weekly themes." We like the "convenience of getting all books and materials needed on topics that we are covering that month." Each year it becomes more difficult to keep Rover on the road. Rising costs of diesel fuel and vehicle maintenance as well as the increase in the cost of library books and educational materials cannot be met by state, local and grant funding for the Reading Rover. Please help "feed" Rover. Use the Reading Rover Pledge Form (pdf) to make your contribution. The Fontana Regional Library is a 501(c)(3) non-profit organization. Your contribution is tax-deductible to the extent allowed by law. No goods or services were provided in exchange for your donation. The donation form is a PDF document, viewable with Adobe's Acrobat Reader. Download the latest version of Reader.